Many years ago I was in need of some money, and a local farmer had a job for me. He had neglected some of his fields for over a decade, and so the land had been allowed to go a bit wild. The average modern industrial farm is first clear-cut, and then plowed every year to ensure that nothing wild returns to the land. But this particular farmer had not been farming, and so the fields had grown up with brush. Aspens and willows had come to re-inhabit large areas, and some of them were over ten feet tall. I was to be paid nine dollars an hour to repossess these fields for agriculture. The tool I was given for the task was a large tractor pulling an industrial-strength lawnmower known as a “brush-hog”. It was nine feet wide and had steel blades an inch thick. 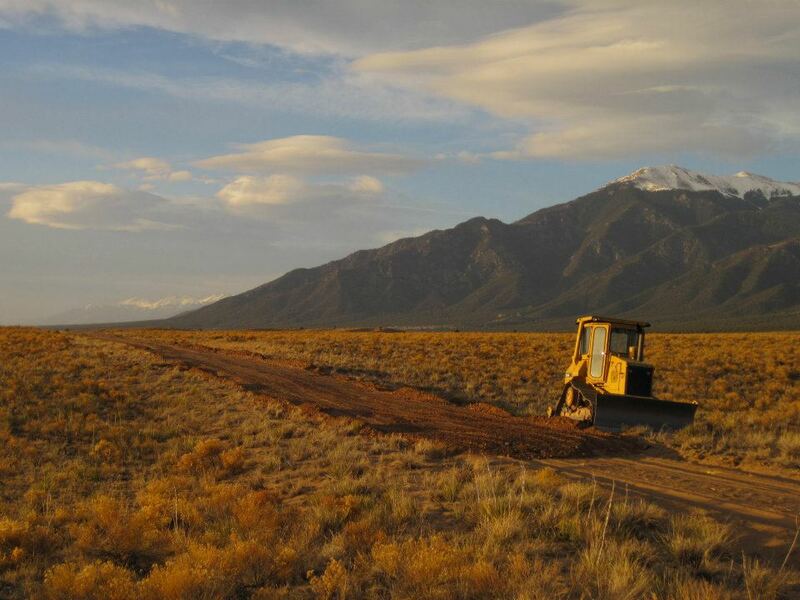 It could mow down and lay waste to any brush or trees small enough for the tractor to plow through, and the tractor was big enough to plow through plenty. It also had a sound-proofed, air-conditioned cab with a cassette player inside. I was grateful for this, since the work I was faced with would certainly be hot, dusty, and dull. However, neither the air conditioner nor the cassette player worked all that well. I spent the next two weeks sitting 16 hours per day in a bumpy, stuffy, diesel smelling luke-warm box listening to scratchy rock and roll and the dull drone of the tractor’s engine. I did this while the world puttered by at a constant four miles an hour, and my mind wandered off searching for any and every fantasy I could conjure to cope with the boredom of my situation. In front of me was a “tangle” of brush and small trees. Behind me was a wasteland of shredded wood and desiccated plant matter. I turned the former into the latter at the steady, constant rate of about 30 acres per day. Each evening at 10pm I would stop, shut down the tractor, clear the accumulated plant-debris off the top of the brush-hog, and go home to catch some sleep. In the morning I would be back at dawn (6am) to grease the brush-hog, fire up the tractor, and start again. By the end of the ninth day, I was starting to feel more than just a little stir-crazy. O n the morning of the tenth day, I approached the brush-hog with my grease gun in the early dawn mist and realized I had forgotten to clear away the plant-debris the night before. Nearly a foot of grass, sticks, and “weeds” were tangled on top of that piece of equipment, and as I bent down to start clearing it off, I noticed something. 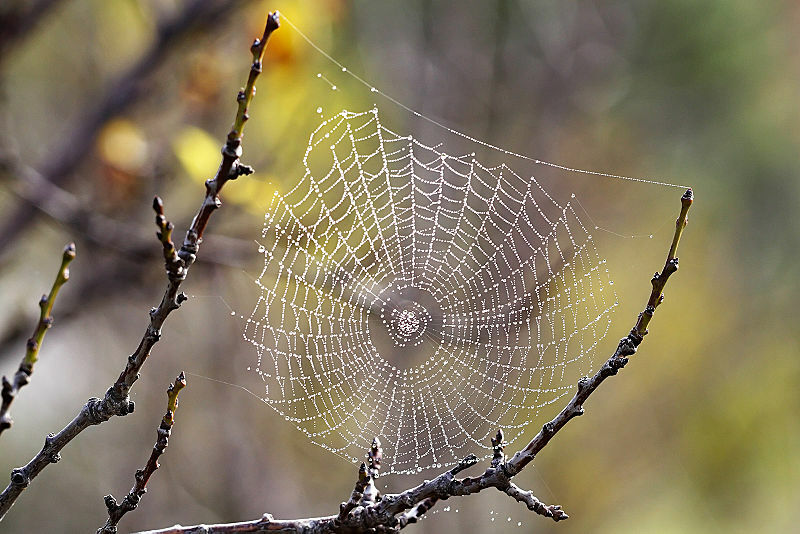 My attention was caught by a delicate spider’s web that had been built the night before on the brush-hog’s steel frame, and now glistened with morning dew. The spider who had built it was like none I had seen before. Her colors and markings were magnificent. I felt myself drawn in, and as I looked closer, I noticed more spiders — at first dozens, then hundreds, and finally thousands — of all shapes, colors, markings and sizes. At the same time, I noticed the insects they were feeding upon, and many thousand more tiny individual lives entered my awareness. There were little bright green jumping bugs and larger brown-green grasshoppers. There were tiny red spiders and large brown ones, long-legged ones, fat hairy ones, and skinny striped ones. 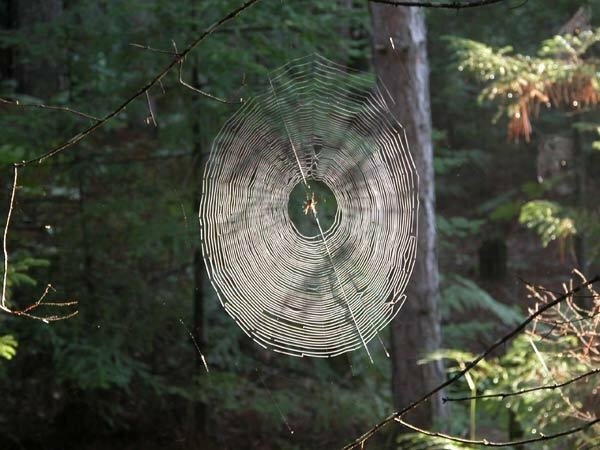 There were bugs caught in webs and web-casting spiders wrapping them in silk. There were wolf spiders stalking and pouncing on prey. There was life and there was death. I became lost in it all — completely mesmerized as if in a dream. Time lost hold on me. The details & dramas of this tiny world absorbed my consciousness completely. Finally I stepped back and surveyed the entire scene before me. I realized that on the surface of the little nine-foot by six-foot platform that was the top of the brush-hog, there currently survived a number of tiny souls in excess of thousands — and all of them going about their lives. These were but a small portion of the refugees of the 30 acres I had laid waste to the day before — these were just the ones who had happened to come to rest on top of the very same machine which had devastated their home. My mind & emotions reeled at the thought of how much life I had impacted while droning by each and every one of those previous nine days in a senseless stupor, stuck inside the cab of that droning machine. I’d like to be able to write that my next move was to walk away from the brush-hog, the tractor and the job, never to return again. I’d like to write that I walked off that farm field and into the wilderness then and there, and that I’ve been living off cattails and venison ever since. But things are rarely so dramatic or simple. I still needed money and I didn’t know what else to do, so I took that experience and planted it deep inside my heart where I knew it could slowly begin to grow. Then I finished clearing off and greasing the brush-hog, got back inside the tractor and traded another day’s worth of life for little green papers. 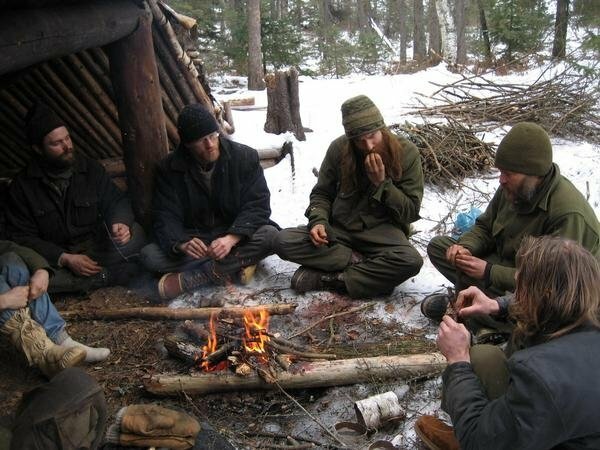 Half a decade later, I was living with a group of new found friends in a primitive camp surrounded by National Forest and on the edge of Wilderness. We were learning, slowly but surely, the hard lessons involved in coming together to live by the old ways and rediscover what it means to be human. On this particular day however, a buddy and I had had enough of the hard lessons, and were speeding along in his jeep toward town to have breakfast at a local diner. As we rounded a curve, we spotted a deer in the middle of the road lying in a spatter of her own blood. We stopped. The vehicle that had hit her must have left the scene just moments before. She was badly wounded, but still alive and struggling. Her hind legs had been shattered, and she was gasping for breath in the hot mid-morning sun. At first my buddy and I didn’t know what to do, but we soon realized we were being asked to help ease her passing. We pulled her to the side of the road, and my friend held her down while I slit her throat with my knife. As we did this my friend spoke softly to her words of comfort, and I apologized for the careless suffering my people were causing. Our eyes met, and I felt tears well up in mine. Then she bled out and died there in the ditch by the side of the road. I whispered a prayer of thanks to her spirit for the gift of her flesh, then we placed her body in the back of the jeep and took her back to camp. She became the freshest, most delicious meat we had had in months. That night we celebrated, and had a feast in her honor. Nearly every one of us mentioned at some point how thankful we were for such good venison. I had carefully skinned her, and had placed her hide in a rack to be tanned. Later in the summer I would carefully transform her hide into soft buckskin, which would be used to make sleeves for a shirt. To this day, every time I wear that shirt the sleeves talk to me, reminding me of the gifts she gave me, not just in terms of meat and skin, but also in terms of life’s lessons. I love this line: “…so I took that experience and planted it deep inside my heart where I knew it could slowly begin to grow.” Thank you for sharing your journey. Thanks fecteau23, it’s good to know when I hit a cord with someone. That’s a great quote, and thanks for the link…I’ll check it out. Strong! I hardly know you in person but I just love you true your writing. Thank you for sharing your story. I had similar experiences on a riding lawn mower – finding snakes chopped in half, sending little animals scurrying in fear, feeling pained for the invertebrates. After that I swore I’d never mow a lawn again, though I did grudgingly once when asked to while woofing. I’ve shared my lawn mower experience with many, but no one has empathized. Where I live now we hand-cut and weed-eat a narrow strip between the house and rainforest only once each year, but still I’m glad when it’s over so all can rest and heal. I wish I could wild-harvest all my food, so I know none of this is happening on my behalf. It’s such a struggle to be true to oneself, but I feel comforted knowing that other seekers struggle too. I always look forward to your posts. I can definitely relate Susan. Thanks for sharing your story too. That quote above about the ceremony before clearing the field for corn planting strikes me as being a hybrid culture, still retaining some of the old animistic beliefs from hunter-gatherer days, but now corrupted by the culture of agriculture. I am reminded of Martin Prechtel’s experience in a similar hybrid culture. I like to make a distinction between living in the Gift, which is living off the interest of Nature’s bounty, and living in the Theft, which is living off the interest while also spending down the principal. Hunter-gatherer’s lived in the Gift; the early agriculturists and pastoralists broke the old bond with Nature, by stealing the habitat and lives of others, including spiders and snakes and many other large and small creatures, whenever they cleared a field for their annual monoculture crops. That was the beginning of a downhill slide into Theft that we now see all around us: Theft ubiquitous and normalized within our culture, and made invisible by anthropocentrism and human exceptionalism. When you felt a sense of caring for the microcosmos of life you saw on the hood of your tractor, you were reverting to the animism that we are all born with but which our cultural conditioning is designed to erase. Evidently, your cultural conditioning didn’t fully take and your aboriginal humanity shone through. Later, I deduce, you came to value that part of yourself more highly than the obtuse insensitivity you were trained to and that prevails in most of the people around you. Or at least that is how it appears to me, whose own cultural conditioning proved weaker than intuition and instinct passed down, somehow, from the ancestors. Please correct me if I misread your story. I don’t think you are misreading my story wildearthman. Thanks for the very insightful comment. I like your distinction between living in the Gift and living in the Theft. Something to contemplate deeply, for sure.